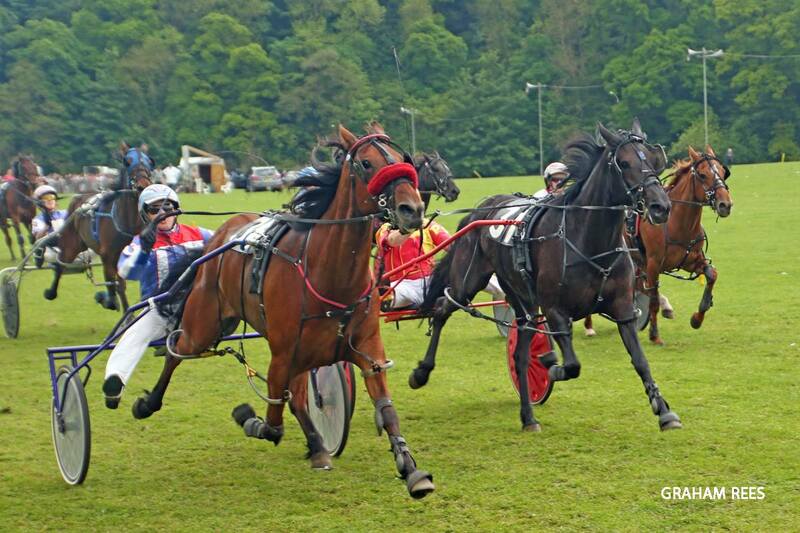 Harness Racing in the UK: 2016 Season: Week 4 - Sun, cider and Scottish success at Appleby! 2016 Season: Week 4 - Sun, cider and Scottish success at Appleby! I did say Appleby was due a weekend of good weather after some of the washouts it's had in the past, and I'm pleased to report that it was two days of glorious sunshine at Holme Farm. And I am even more pleased to report that the Scottish contingent did their country proud with a whole host of winning horses, winning drivers, and quality performances. 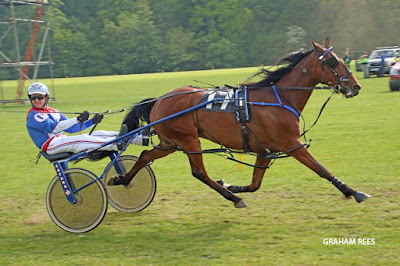 William Greenhorn kicked things off for Scotland in the first race driving Bowriver for Alf and Joy Swinbank, a couple who have supported Corbiewood over the last few years by bringing horses up over the border to race (including 2015 October/November Horse of the Month, Springhill Dustin). 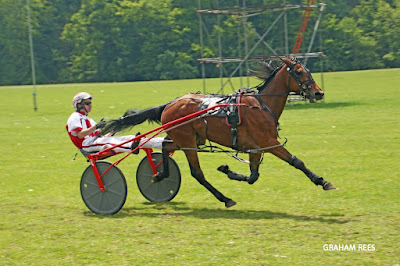 Bowriver won going away in the first division of the maidens. 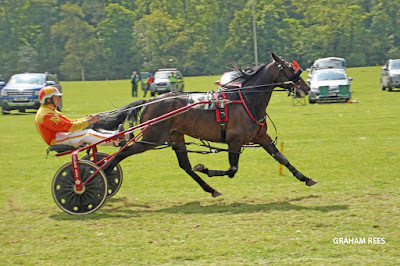 The first Scottish horse to pick up a red rosette was Evenwood Ruthless in the third heat of the handicap, for owner Karen Kennedy, trainer Mark Kennedy and driver Gordon Gilvear. Gordon's victory was made all the more impressive considering his right stirrup sheared off during the race. When called into the stewards to explain why his foot was out of the stirrup for some of the race (as seen below in the photo), his reply was, "What stirrup?!". Evenwooddancinjess and Grant Cullen who had taken up the running down the back straight stayed on for third. 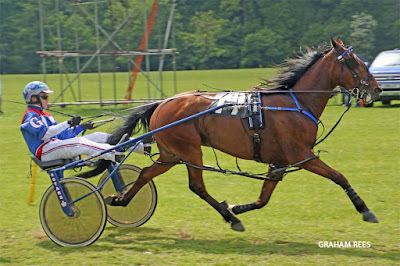 Grant picked up another third in the next race with I Can Dream, missing out on a spot in the final on both occasions as the first two from each race progressed. 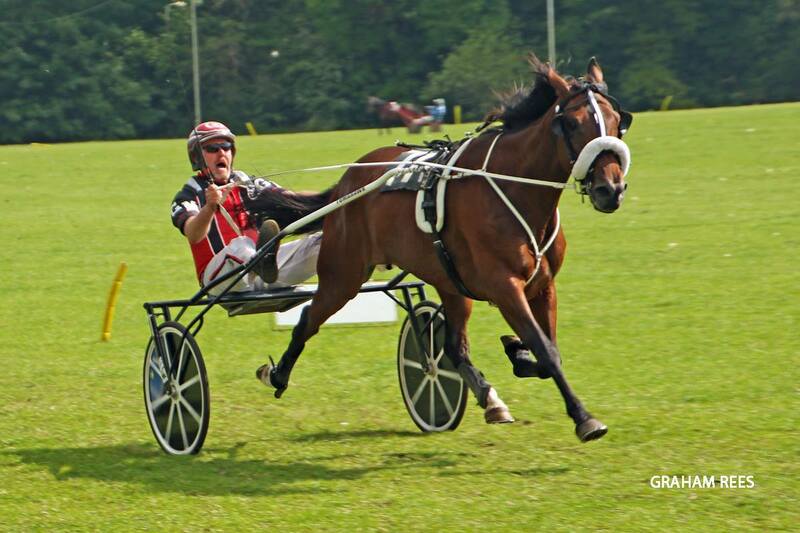 The next Scottish winner came in the form of Le Trot/TrotBritain's biggest supporter north of Hadrian's Wall: Gregor Menzies. Viva Sautonne, a seven year old mare imported from France, led out and made all to give Gregor, Lisa (Farrelly) and family their first win of the season. In the final, Sports Trick was the standout favourite however I fanced Rufus (Evenwood Ruthless) to run into a place so bet him accordingly. As the only Scottish contender in the final, he dug in deep to hold on from Cochise to finish second behind an impressive Sports Trick. I spoke to Gordon after the final who said he'd given the horse a bad drive but to finish second was an achievement in itself. Well done to Karen & Marky, and to Gordon, for their success on Sunday. On Monday the Scottish got off to a flyer with '2015 SHRC Driver of the Year' Grant Cullen and Springhill Art winning the first race. The four year old mare, trained by Grant's father Paul, won with ease on her first ever start. 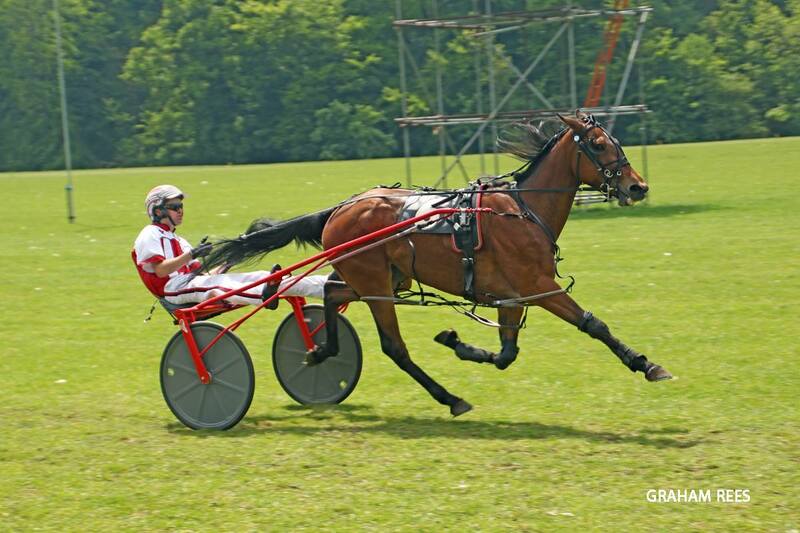 The second division was won by Rhyds Opal, however despite being an English-owned and trained mare, she was partnered by William Greenhorn who tasted victory for the second time over the weekend. Making it three in a row for Scottish drivers, Gordon Gilvear romped home on the ante-post favourite Master Plan in the first heat for the Monday final. The Gilvear-bred, owned, trained and driven gelding beat Irish raiders Lyons Nant Hall and Coalford Silk in impressive fashion. If that wasn't enough, in the third heat it was a 1-2-3 for Scotland, with Camden Castellano (Hugh Menzies driving for John Menzies) taking the honours from Reverend Run (Grant Cullen driving for Paul Cullen) who narrowly beat Pantihistamine (Gordon Gilvear driving for Tony Allan). 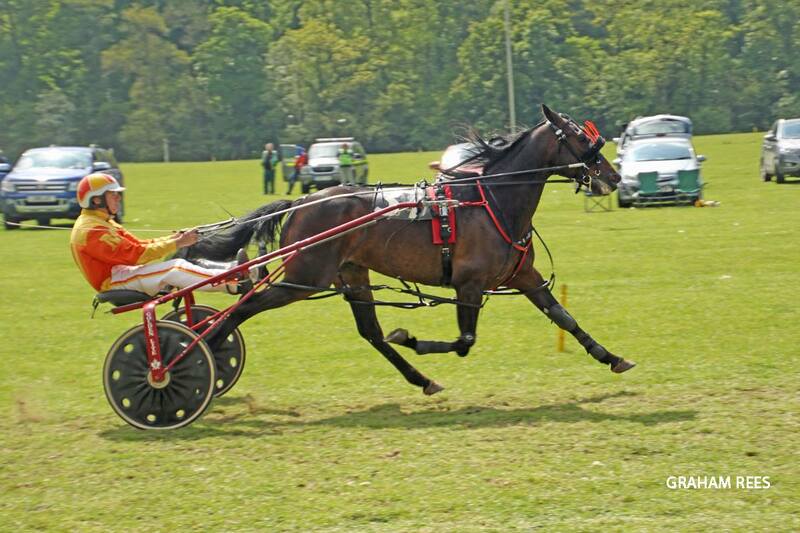 In the fourth heat, Bayrigg Millionayr put in a good show for Richard Thomson to finish second and qualify for the final, making four of the 10 final runners Scottish trained and driven. William Greenhorn went on to notch up his third winner of the meeting, again partnering a filly owned and trained by Paul Johnson - Elsa Camden. And the next race the novice, went to George Drysdale and My Left Foot after plenty of thrills and spills when horses broke and ducked inside the track resulting in a handful of disqualifications. Regardless of the drama, the winner was the best finishing horse and a deserving winner, again for Scotland. Finally, it was the pinnacle of the meeting: the Appleby Spring Monday Handicap Final. Despite there being 4 Scottish runners in the final, all hopes were pinned on Master Plan. And he did not disappoint, going on to win from Lyons Nant Hall, who in turn pipped Lyons Mischief to the line. Before the race I'd been chatting to an Irish friend who asked what I thought would win the final. When I replied with 'Master Plan', he told me he thought Nant Hall could beat him. The gentleman hadn't been at Corbiewood the night Master Plan posted the fastest time of the season (2.02.15) when beating my poor mare Star (who also was beaten in Grade 1 races last year by Evenwood Ruthless, Camden Casper and SHRC Horse of the Year, Greentree Shorty). I'll never forget how tough it was to win a Grade 1 race last summer! Gordon was oh-so-close to winning both finals this year, and Karen Kennedy worked out he'd amassed £6600 in prize money across the two days. It is also worth noting that Steven Gilvear, as the breeder of Master Plan, bags himself the Breeders Bonus of £500 for winning the selected aged horse race with a British-bred horse as chosen by the STAGBI Directors prior to the start of the season. There you have it folks - you can't disagree that it was a tremendous weekend for Scottish horses and drivers. 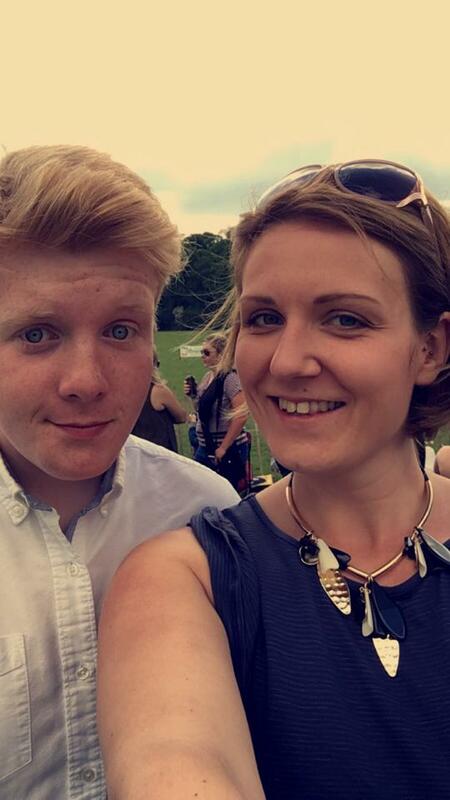 Many of those who ran impressively had already run (and some of them won) at Corbiewood at the season opener. No doubt many will return on June 12th for the New Fair meeting at Appleby. But before then we have two Friday night meetings at Corbiewood, and a bumper entry already in for the first of these on June 3rd. Before I go, it's Smarty's favourite segment: "Things that get my goat". I wasn't going to post anything this week, as immediately following the weekend I felt unusually optimistic about the remainder of the season. It's amazing what some sun and good racing will do to make you forget that the sport has, at best, plateaued, and at worst...well it's a slippery slope, put it that way. So I was going to finish on a high note, and maybe surprise those who think I live to criticise. And then I discovered the not-so-random integrity testing undertaken at Appleby and memories of BHRC Committee meetings during the winter came flooding back to me. Call me pessimistic, but you'd be burying your head in the sand if you did. It is my understanding that each horse racing in the Big Guns race on Monday was pre-race tested. Fine. It is also my understanding that after the race, only one horse from the eight was tested. Fine. Except it was the one horse in the race that illustrated how completely pre-meditated the testing regime was. The horse that was tested, after a true-to-form performance, was the horse trained by Rocker Laidler. Not content with banning Alexis for using a low-grade banned substance and creating a whole host of new rules (including one which requires anyone applying for a Public Trainer licence, in this instance Rocker, to disclose any material information which may be of relevance to the application...including, in the words of the Vice Chairman at an official meeting [although I doubt it made the official minutes, even though I was taking them], "where his wife lives"), now they're going after her husband as well. It's an ugly vendetta. Gordon Garnett started this witch hunt, but it's being maintained by those who came after him and those who remained from under his reign. While we as a sport welcome a 'celebrity' attending the VDM in Portmarnock in August who has previously failed a test in the USA, people within our own sport shun certain individuals in the UK who have failed tests for lesser substances (but, bizarrely, not others). Oh, and before I go, the rule which has effectively banned Alexis Laidler from living in her own home because it is located at the stables from which her husband now trains with a Public Trainer's licence...well, just have a think about how many other people that new rule can affect should they fall foul of a rule in the future. Food for thought. Because if it applies to one, it must apply to all. You know who'll make the biggest noise of all if it doesn't. Michael O'Neil (Ayr Standardbreds) & I enjoying the Appleby sunshine!